SANTA ANA, Calif.—A Halloween tragedy that killed three teenage girls is shedding light on the epidemic of hit and run crimes in Southern California. On Friday night, twin girls Alexandra and Lexi Perez, and their friend Andrea Gonzalez, all 13 years old, were killed around 6:45pm while crossing a street about a block away from their home. They had just left to start trick-or-treating in their Halloween costumes. Jaquinn Bell, 31, was booked Sunday as the suspect in the case, on the charge of a hit and run felony causing death, said police. He had been driving on a suspended license. Bell was convicted in August of another hit-and-run and driving under the influence, according to Orange County Superior Court records. He served 10 days in jail and was given three years of probation. Friends and family left candles, mementos and donations for the families of the victims at the street corner where the collision on Friday took place. “As a father of three, this could be something that could happen to any of our children,” said Miguel Pulido, Santa Ana’s mayor at a press conference on Monday. On Saturday evening, Nov. 1, 44-year-old mother of eight Daniella Palacios was also killed by a hit and run driver while riding her bicycle in Anaheim, Calif.
“We do have a lot of hit and runs every year,” Carlos Rojas, Santa Ana Chief of Police. Los Angeles is the epicenter for hit and runs. The LAPD reported to the City Council in February that there were 21,000 hit-and-run incidents in 2013, with 41 fatalities. In 2009, 48 percent of the city’s crashes were hit-and-runs, compared with 11 percent nationally. Officials say only 20 percent of hit and run drivers are caught. The number of fatal hit-and-run crashes are increasing in the United States, according to data from the National Highway Traffic Safety Administration. One out of every five pedestrian fatalities were hit and runs in 2011. California Assemblyman Mike Gatto, representing part of Los Angeles, has authored several bills to address the problem. AB 47 was introduced last year and designed to create a “Yellow Alert” system to help catch hit-and-run offenders. AB 1532 was introduced earlier this year and required a mandatory six-month license suspension for anyone convicted of a hit-and-run involving another person. Both bills were vetoed in September by Governor Brown, who said he thought current laws were adequate in a letter to the Assembly. Experts say drivers are more likely to flee an accident if they’ve been drinking or if they are driving without a license. 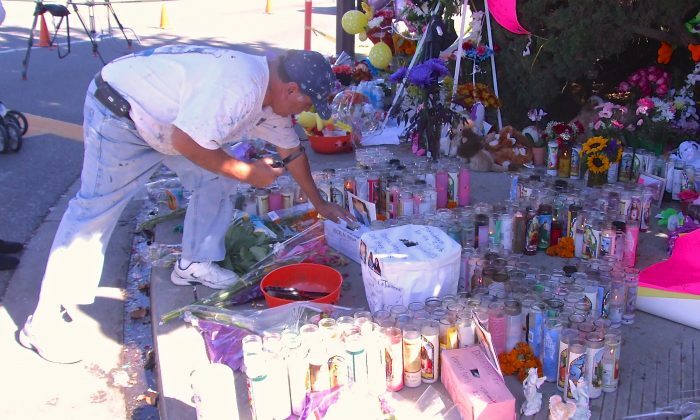 In Santa Ana, some residents have complained that there needs to be more lighting near the intersection where the teens were killed on Halloween night. Officials said they were looking into the issue. The speed limit at the site of the collision is 45 miles per hour. NEW YORK—A year after Martha Puruncajas’s son Luis Bravo was killed by a hit-and-run driver, she still has no closure.